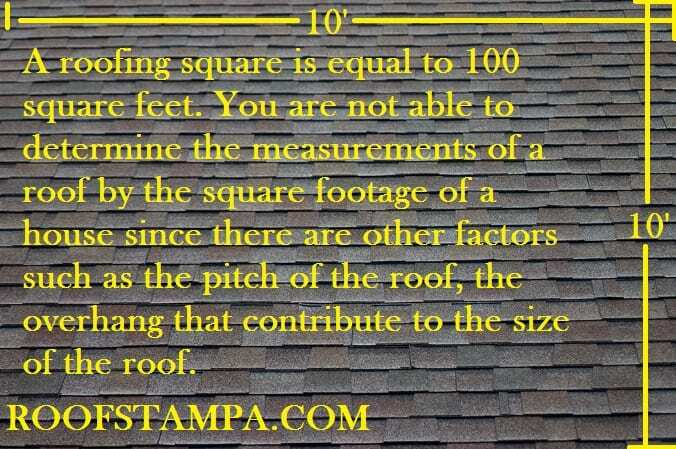 A roofing square is the equivalent to 100 square feet. It doesn’t matter how 100 square feet is derived as long as you have measured an area of 100 square feet on a roof then this would be considered a single roofing square. The area you measure could be 10′ x 10′ = 100 square ft, or 5′ x 20′ = 100 square ft either way if you have still measure a single roofing square. If you are in the Tampa Bay area and need a new roof, reroof, or roof repair please give us a change to submit a FREE ESTIMATE. We handle all different types of roofs including shingle, tile, metal and flat roofs We cover the entire Tampa Bay area including Hillsborough County, Pinellas County, Pasco County, Polk County, Sarasota County, and Hernando County.